Making donuts is a family favorite for breakfast, dessert, and craft time! This is one activity that has all ages in the kitchen talking, laughing and shaking things up! Line up the biscuits assembly line style. Use a cap from a 20 oz. soda (or something similar) to make a hole in the center of the biscuits. Heat 3 inches of oil on medium/high. Place donuts and donut holes in the oil for about a minute on each side, until golden brown. Remove from oil and place on a paper towel to soak up the excess oil. 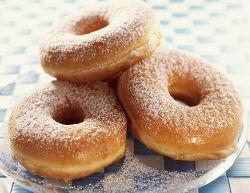 Give each child a small bag with some sugar in it, add the warm donuts to the bags and let them shake, shake, shake until the donuts are coated! 2 cans of biscuits will make about 16 donuts and holes. The total cost is less than $1.50! We usually do this activity before a movie night. Warm donuts and a family movie, now that is a great evening! We do this only we use powdered sugar!!! They are sooo yummy and fun! methinks the dunkin donuts has some competition, what do you do for sprinkles? This sounds easy and fun! Can’t wait to try this with my son. Thanks for sharing this with us! i’ve never heard of making them this way! How neat! Mmmmmmm….. It looks oh so good! I grew up with biscuit donuts. We didn’t use a cutter, we just pulled a hole in the middle. Chocolate gravy on them. Yummy. I grew up on these but we baked them dipped them in melted butter and then cinnamon sugar!!! I never thought of frying them!!! I am definitely going to try this!!!! We do this except we empty a packet of hot chocolate mix (without the mini marshmallows) in the paper bag and then shake shake shake… the kids love these! My mouth is watering. I am so excited to try these. We are going on vacation so I am thinking that this is a great breakfast treat to make. YUM! I am going to mix up the powder sugar and cin right now. I already packed the biscuits but I was wondering if this was the buttermilk biscuit or if the flaky layered ones would be good. I love these donuts, but we roll ours in homemade powdered sugar glaze. So good! This is a great idea, but calling them “homemade” is a bit of a stretch. I’m glad so many of you have fond memories of making these! I hope my kids feel the same way! You can pretty much shake them in anything, just do it while they’re still hot. And Emma, I thought about that, but since I was making them at home and they were not bought, I called them homemade. I hope you find a good made from scratch recipe! these look super yummy! Think I’m going to give it a try with cinnamon sugar, mmmm! This is just like the donuts they have at the Chinese restaurants. Some people call them biscuits and I laugh because they are fried so that makes them donuts. They are so yummy and good when they are fresh. We make these and add some cinnamon to the sugar … YUMMY!!! These are a family favorite! My kids and hubby LOVE them! My family loves them when I make French Vanilla pudding & inject it after the donuts cool a little. I forgot to mention after filling the donuts with pudding I ice them with chocolate icing. Bonnie, Any kind will work! I usually use the cheapest ones I can find. I decided to give this a try on a rainy day with my kids. I’ve never made homemade donuts before (I’m a huge dunk’n donuts fan!) and I love making my own biscuits but this sounded easy and has good reviews. So I made it as directed not knowing what a biscuit-donut was or if my kids would like it. It was super easy. Very cheap. And my kids loved them. So we have something now to tell friends and we’ll be making more soon! Thank you for sharing!